KABUL -- A gentle light filters into the room through grey curtains as Ahmad Masoud Samim, 31, and his colleagues review applications for employment at the Ministry of Communications and Information Technology. Masoud, who has a master's degree from India, has held the position of Human Resources Director since 2013. 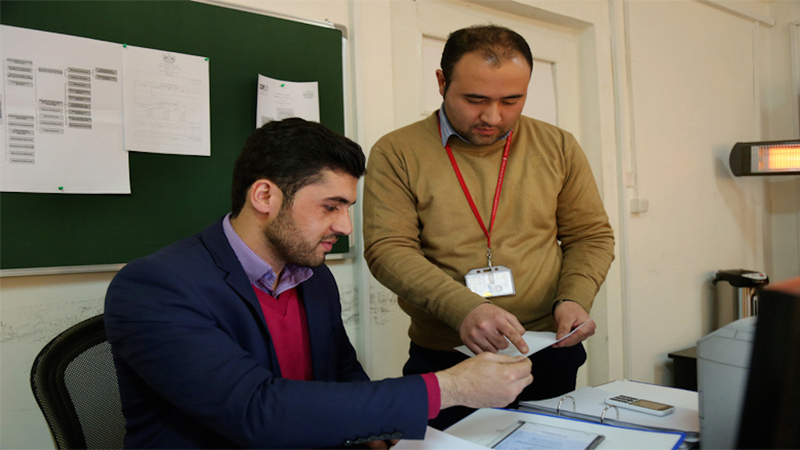 He was recruited to the ministry through the Afghanistan Capacity Building for Results (CBR) programme, which works with ministries fundamental to service delivery and economic growth by providing funds to hire top-tier civil servants, technical assistance to support reforms, and civil service training. Government ministries are facing multiple problems at the management and leadership levels due to a shortage of expert and professional capacity. As a result, government programmes are often not implemented as effectively or efficiently as they should be. But the introduction of experts into governmental offices is gradually having an impact. "Expert and professional staff come to our governmental offices through the CBR," said Masoud, who has worked in human resources management for eight years. "This will improve effectiveness in the ministries and reduce opportunities for corrupt practices," he said. "This is apparent in my own office, where we have seen improvement in performance." The government launched the CBR in 2012 with the goal to improve the capacity and performance of priority line ministries and independent agencies in selected reform areas. The current phase of the programme runs to the end of 2017. The total CBR budget of US $150 million (10 billion AFN) is provided through the Afghanistan Reconstruction Trust Fund (ARTF), administered by the World Bank. CBR activities are aimed at, among other objectives, enhancing ministries' capacity to efficiently spend their development budgets, streamline business processes, and improve quality control and compliance of standards set by their reform programmes. The programme works with 30 ministries and independent agencies, in which it plans to recruit 1,500 expert and professional staff in managerial and other leadership positions during this phase of the programme. So far, the CBR has selected 751 professional staff, including the positions of provincial director of agriculture and provincial human resources directors in a number of ministries. Capacity building for state institutions is also key to the CBR, which plans to train a total of 200 civil servants at the Civil Service Institute. The programme has trained 93 civil servants so far, with 40% of the trainees being women. Employees go through a 14-month training period, after which they return to their offices to put the learned skills to use. Implementation of the CBR is overseen by the High Council on Reform, which was established by President Ashraf Ghani in 2015. "We recruit key people in places where employment and income are generated," said CBR Director Najibullah Wardak. "This will help circulate the country's income sources and help it reach economic sustainability and self-sufficiency." Applicants are recruited through a transparent process based on the Civil Service Law. The recruited staff generally have higher education degrees and sufficient experience to match the requirements set by the programme. They are paid through the CBR budget, and the programme also provides incentive payments to them. 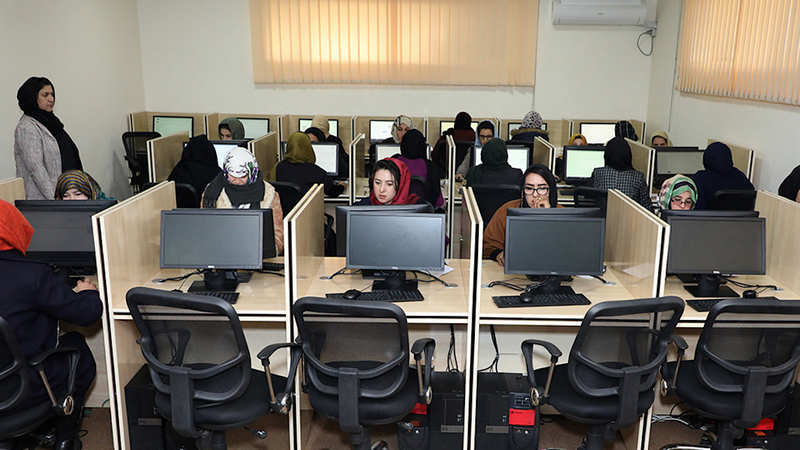 In line with civil service requirements, a recruitment quota of 30% is reserved for women. It has recruited eight qualified women in various leadership positions at different ministries so far. Nonetheless, the programme faces challenges in finding candidates with the right expertise and education to fill positions, as well as those interested in working in the provinces rather than the cities. "In spite of many challenges, we have managed to score big achievements," Wardak said. "The government provides strong political support for this programme, which [helps] makes it even more successful." It is a good program, provided that it fairly and justly uses all educated and young individuates who have completed their education with tons of dreams and ambitions. It has been two years since I graduated from Herat University, and yet, I'm still unemployed with so many problems. Think about us, the youth, who do not have money or any powerful and influential acquaintances. We only have God. It's a very good and appropriate action. Yes. This is a nice and effective program to increase the capacity of our ministries. You have brought up a very good point. One of the underlying causes of underdevelopment of our beloved country is entrusting tasks upon those who are not professional, which has led to the lack of efficient utilization of economic resources. Time, which is the most precious possessions throughout human's life, is wasted in the absence of expertise and professionalism. In other words, time is not being utilized as it should. In my opinion, it is an unacceptable process. The reason is that I myself work in one of these government offices. It has been noticed that the CBR project is not an sound process according to which 10 to 20 years experience of veteran employee is being completely disregarded, and the sole priority is given the education. This is against the low that one individual receives 6,500 Afghanis while another receives 150,000 Afghanis. The CBR process is a very good process; however, the power and authority is still with the minister because I took part in the CBR exam, but it is not as transparent as is said. There was a vacancy announcement for the position of Directorate of Nuristan Urban Development in the Ministry of Urban Development. We took part in the test for the position; however, they did not announce any winner. When the same post of Directorate of Urban Development was advertised again after two months, we also take part in the test again, then they put us on the shortlist. We were 9 persons in the test and we gave the test again. A ministry staff member told me that the person has already been selected for the position; however, when we saw the process of testing, he was really selected. He was considered the winner in the test. He has got 23 marks in the written test, but he did not get enough marks to qualify for the interview. Based on the law, one had to get at least 25 marks. He was invited for the interview and he was given 50 marks in the interview which made a total of 73 marks, and then the ministry and CBR process members announced him as the winner. 1. Following the completion of 6 months, was he in a position to be candidate for this post again based on the law? 2. considering the 23 marks he has received in the written test, he was to be withdrawn from the interview process; however, he was invited [for the interview]. 3. when he received only 23 marks in the written test, how much good he was in studying for the interview? Did he turn to super-genius in one day and received 50 marks in the interview? isn't is impossible? Or it means that he was aware of the interviews questions. Or maybe he was selected by the minister, so what CBR process means here. If you have doubts in our writing, you can ask for the details from the Ministry of Urban Development for the winner's documents. Thank you for providing this information my friends. Unfortunately, however, not only the process which you have undertaken is not transparent, it also broadened the extent of corruption and bureaucracy in government offices. All processes are now being conducted based on personal preferences. I have a Masters degree and I used to work in one of these offices as an employee. Upon the initiation of this program/process I was terminated from my position and my job was sold to another individual in return for US $5000. This process appears to be extremely transparent. In reality, however, it is unfortunately a wolf in sheep's clothing. This wolf is the one who makes people strangers one after another and even takes away their few pieces of bread. I work in an office where the hiring process through CPR is completely based on relationships and nepotism. This process has had no effect whatsoever on the improvement of this office. Quite the contrary, it has broadened the extent of corruption. If there was any transparency in this process, all administrative offices should be deemed incompetent. One of the best ways to fight corruption is to have a professional staff. Yes. It is a very good program. It is a good program, of course if it will be implemented uniformly, independently, and continuously all over the country for all citizens. I have a Bachelor's degree in Education and I was graduated with required grades. I worked for two years in Electronic Identification Cards department and I would like to work in a position related to my field of education. 1. we give priority to the youth who show extraordinary and strong initiatives in their work. 2. we value work experience. 3. the related profession should be given attention. 4. their age should be considered. 5. their education level should be considered. Considering the above mentioned points, Afghanistan will get rid of the existing misfortunes in the future and we will truly go ahead toward Ghani's Afghanistan. * the term "Ghani" means rich/wealthy which also indicates the name of President Ghani. Undoubtedly, this is one of the most effective joint programs between the Afghan government and the World Bank. I have been working for the Administrative Reform Commission for 10 years now and I strongly believe that civilian employees are in the front line of providing public services. If the potentials of this office improves and its transparency increases, then people's satisfaction with the government will increase subsequently. One of the ways in which the human resources and administrative potentials can be increased is through recruiting of competent and capable individuals, so that the public sector will be able to compete with the private sector. Hence, this is a very productive and useful program. Thank you. I do not have any specific comment. I only want to make a suggestion as a citizen of Afghanistan, and my suggestion is that works should be entrusted upon those who are professional in their fields. I am optimistic about this. I, however, hope that technical and professional individuals can be recruited for these positions. I hope that they fulfill their heavy responsibility as it should while considering national interests, so that they can serve the oppressed people of Afghanistan. Indeed, you have initiated a fine and appropriate process. With the implementation of such good plans, we can also witness an overall change throughout our country. With the help of such mega-projects we can achieve great success. We, the people of Afghanistan, announce our strong, general support for these huge projects, since all the Afghan people need to benefit from professionalization of every office in their own country. The government must improve capacity building programs, in order for the capacities and performances of ministries throughout the country to be improved. My opinion in this regards is that unfortunately the employment process in public sector is more based on relationships and favors, while merits and competencies are rarely play a role. The program which is underway by the World Bank is very useful and effective. If this support continues, then undoubtedly corruption will be gradually reduced in public offices. If this support from the World Bank merely remains as a project, it will not solve any problem. I am personally very interested in being included in this process. Accepting responsibility is one of the basic indicators of progress in for providing security. 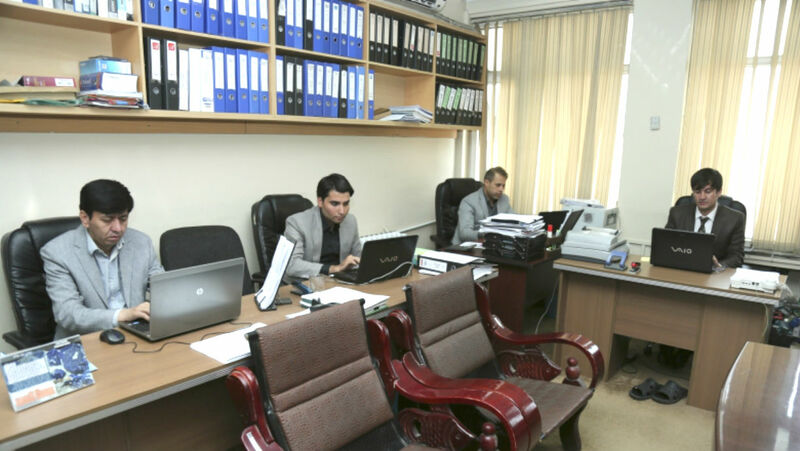 The National Procurement Authority (NPA) is proving effective in the fight against corruption in Afghanistan.